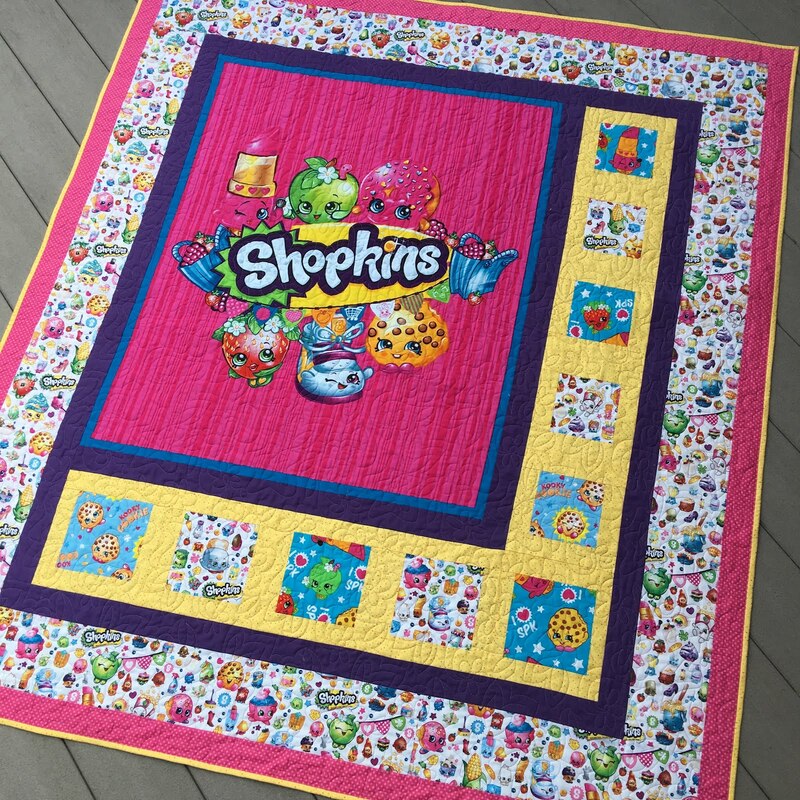 Do you know what Shopkins are?! They are 1" high collectible plastic figures based on supermarket items, with faces and names. There are a lot of them for children to collect and play supermarket with. Regina made this adorable Shopkins quilt for a little girl's birthday. 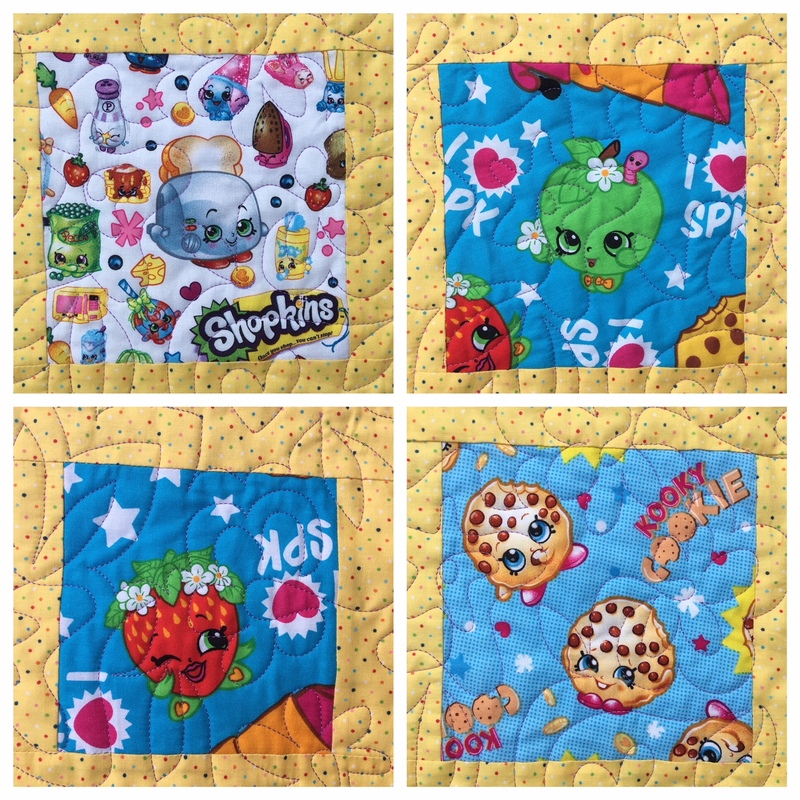 Here are a few close-ups of some Shopkins. Toasty Pop, Apple Blossom, Strawberry Kiss and Kooky Cookie are pictured below. This edge-to-edge design is called Bloomin Stars. Super cute quilt, Regina! And I'm glad to learn what Shopkins are!!! 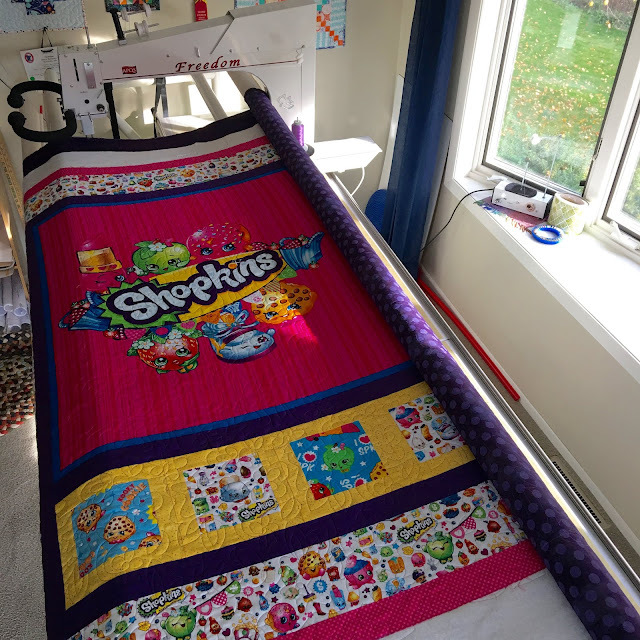 That little girl is very lucky to get such a cute quilt! The quilting is a nice compliment. I've never heard of Shopkins before. My kids probably would have loved them-food and cuteness! Nope, never heard of these before. I do feel out of it with things children love, unless my Gsons talk about it. Another fun panto you used on this one. Shopkins are new to me too. I can tell my kids are grown, because I'm out of the loop! Fun quilting design! Love all those bright colors! I just discovered Grunge Dots recently, so it's fun to see a big piece used as a backing. I never knew about Shopkins before and I do now; just in time to have these for my granddaughter. Such a cute quilt and I really love the grunge backing--and as always the quilting is perfect. Too cute, and a great layout to showcase the other Shopkins! That is a cute quilt and I love the backing too! 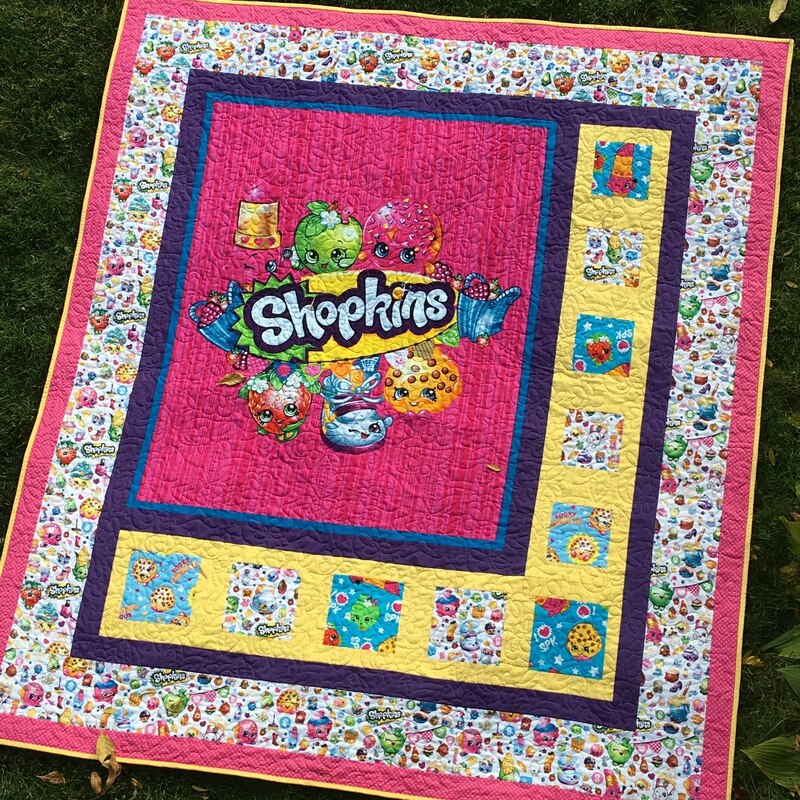 I have small great granddaughters, so may know more about Shopkins in the future. I love that quilt design! So fun! Your quilting, as always, is lovely! 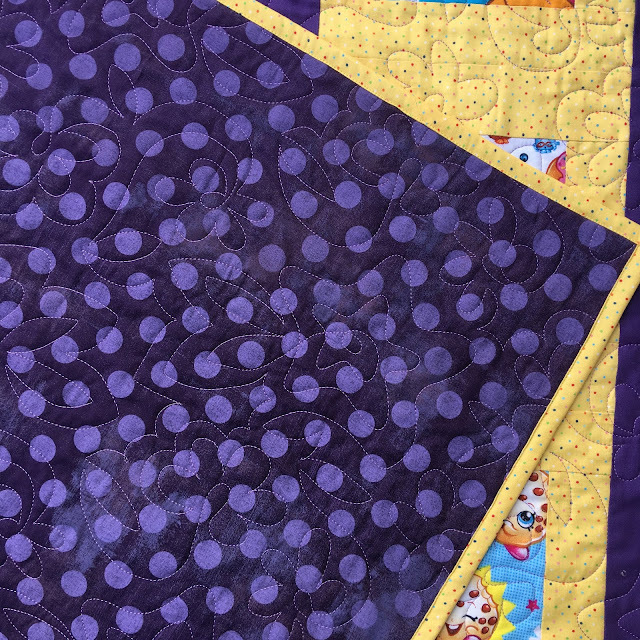 I like the playfulness of the quilting design - perfect choice for this quilt!